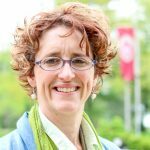 The School of Journalism and Mass Communication is happy to announce that Professor Susan Robinson was recently awarded the H.I. Romnes Faculty Fellowship. The fellowship is a prominent award funded by the Wisconsin Alumni Research Foundation that is intended to fill the gap between the University of Wisconsin-Madison’s divisional Research Committee’s original research support for new faculty and the Mid-Career Award for Faculty Research. The H.I. Romnes Faculty Fellowship gives Robinson $60,000 in research support that may be spent over five years beginning in July of 2018. Currently, Robinson is working on a multi-year, multi-phased, multi-method project that will explore the ethics of journalism production around racial issues and political polarization in the world of social media. She will be using the additional funds awarded in the fellowship to hire graduate students to assist her in her research as well as pay for access to a database of reporters to survey, conduct focus groups and provide incentives for participants. All of Robinson’s research centers on improving civic engagement and democracy. Her research project will work with newsrooms, foundations and journalism schools across the country in order to develop better ways to rebuild trust between reporters and their local communities. Robinson is the Helen Firstbrook Franklin Professor of Journalism in the SJMC who teaches journalism studies, news reporting, multimedia and social media classes at both the graduate and undergraduate level. She also consults for various news organizations and collaborates with numerous organizations while teaching at the SJMC.